If you ever thought about raising butterflies with your little ones at home, I have some basic tips for you! As I'm sure you've figured out, I am not a butterfly expert. If you want all of the best information from the experts, feel free to visit them at MonarchWatch. I have raised and released over 100 monarch butterflies over the past few years, so my tips come from what I've read and my own experience. 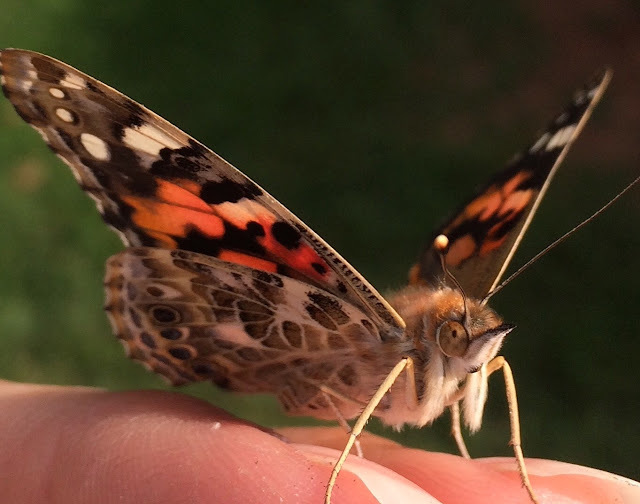 Just a reminder that I'm not an entomologist or a lepidopterist (you can google that one)! These are just my tips from my own experiences. They're gorgeous. Have you ever seen a monarch butterfly? They need our help. Read all about the plight of the monarch here. They're fairly easy to raise if you have milkweed near you. Their chrysalis is beautiful- light green with little gold flecks. Watching them go through the entire metamorphosis is unreal. To watch a monarch emerge is simply awesome. Monarchs have a complex life and follow specific migration patterns. They spend winters in Mexico and make a long journey here to continue their life cycle. So by raising them, you're not only learning something, you're assisting in keeping their species alive. How cool is that? Well, you need to find yourself some Monarch caterpillars! You can try buying a kit, but that can be pretty expensive due to shipping costs (they will only ship east of the Rocky Mountains). Your next option is to look for milkweed plants. Monarchs lay their eggs on the underside of milkweed leaves. The milkweed pictured below is swamp milkweed. You can buy it in your local garden center and they eventually bloom a little puffy flower. They spread quickly and are perennials, so each year you should have a few more plants (and sometimes they pop up in places you don't expect). These are technically tropical plants, so after a harsh winter, you might find that they don't return again in the spring/summer as perennials should. There is also a wild milkweed, which is where I seem to find the majority of my caterpillars. I know where the plants grow wild in my neighborhood, so I always check the underside of the leaves (starting in early summer) for eggs or caterpillars. When you break off a leaf, a milky substance comes out (hence its name!). But do NOT eat it and be sure to wash your hands after touching it. You especially don't want to get it in your eyes. Wild milkweed grows on the side of my property and in my neighborhood. I check it every few days in the summer for eggs and caterpillars. A word of warning here! Before you start looking for anything, remember this. See these fuzzy guys on the milkweed pictured below? Do NOT touch these guys!!! 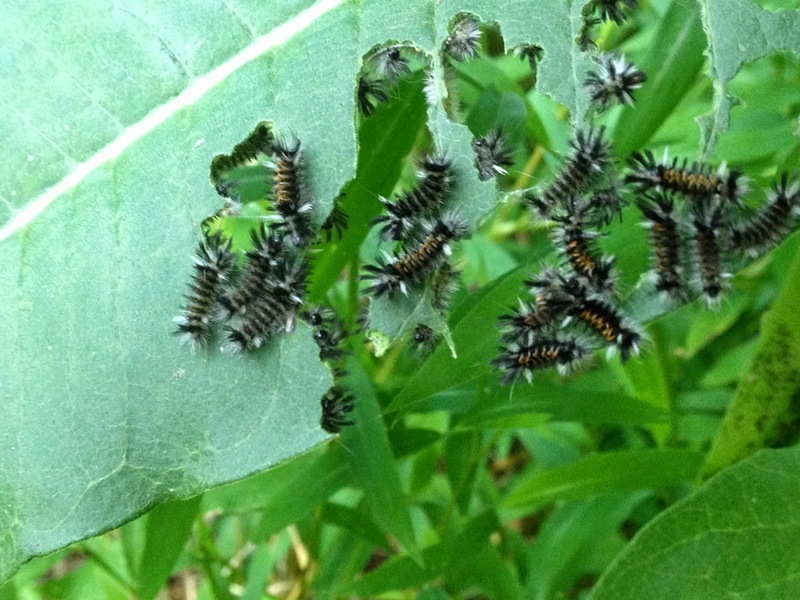 milkweed tussock moth caterpillars - do NOT touch! These are NOT monarch caterpillars, they are milkweed tussock moth caterpillars. Monarch caterpillars are smooth, not hairy or shaggy like this. Most often, caterpillars that look like this should NOT be picked up. These guys have a defense mechanism that can cause an itchiness to your skin, almost like you were stung. So leave them be. Monarch caterpillars usually do not cluster like this either. These guys will also devour your milkweed plant very quickly. Monarchs do NOT lay their eggs in clusters and their caterpillars don't cluster either. Remember, NOT a monarch caterpillar! Do not touch this guy! A monarch butterfly egg on a milkweed leaf. I actually saw the butterfly land on the leaf and lay this egg, so it was easy for me to find it. Eggs are not easy to spot unless you know what you're looking for. I cut this entire plant and took it home with me because I was afraid of damaging the egg. There were plenty of other milkweed plants around when I did this, so don't cut one down if there aren't many in supply. I left the stalk of milkweed in water in my house for a few days (I stuffed a little piece of paper towel around the stalk to prevent any eggs or caterpillars from falling into the water- you can also use a cotton ball. Another suggestion is to place your milkweed stalks in floral tubes. So easy!). After a few days, the egg hatched and the tiniest of tiny caterpillars emerged! Do you see that little speck to the right of my calloused finger? Above the Jersey Momma words? That's the baby caterpillar. A baby monarch caterpillar, newly hatched from an egg. He's super fragile so I left him right there until he was big enough to move into a safer container (even then, I moved the whole leaf). 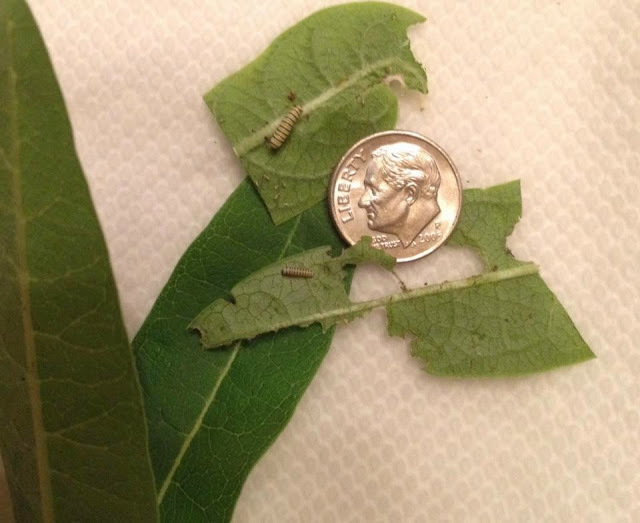 Baby monarch caterpillars have a sticky substance (like a little thread) on them to help them stay on that leaf. Sometimes if you try to touch them or the leaf, the baby can get stuck to your hands or clothes and you don't even realize it. So just leave them be. They know what to do! 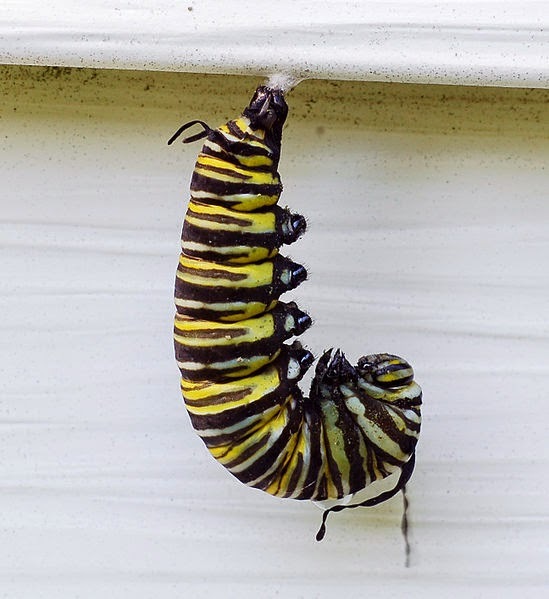 What Do Monarch Caterpillars Look Like? When the caterpillars emerge, they are very small. They range in size based on when they were born. Some are super tiny, or you can find them larger, about an inch or longer. They are yellow, black and white striped (very cute, as far as caterpillar standards go). When I find them, I usually take their whole leaf home with me in a small container (be sure your container has small air holes poked in it!). I will not take the whole stalk of milkweed if there is not enough milkweed there for other monarch butterflies. This photo shows how small the caterpillars can be- even smaller when they are first born! Another picture of various sized caterpillars. Once I get them home, I keep them in the small container, lined with a damp paper towel. It's important to keep a close eye on them (but don't disturb them). I check on them often just to make sure the leaves aren't dried up or that they haven't crawled out. If you need to add new leaves, be sure to rinse and dry them to remove anything that might be potentially dangerous to the caterpillar. I learned this the hard way when I accidentally gave a caterpillar a leaf that had been sprayed with a pesticide. If you buy a milkweed plant from a store, be sure to ask in advance if it has been treated with any chemicals or pesticides. As per a reader's suggestion, I now use water tubes to keep cut leaves in, too, to keep them from drying up! You can buy them through my Amazon affiliate link here. they will occasionally crawl off of their leaves and remain very still. This is usually when they are shedding their skin, so just let them be! In the beginning I used to think they were sick or needed me to prod them back to their leaves. Not the case. Once they shed their skin it will look like a little black ball. They usually eat it, so just leave it there. caterpillars poop! (who knew?) You will see lots of little pellets around. They are called frass. It's just plant matter, so don't be grossed out. Clean this out daily so your caterpillars aren't walking around in their own poop. Be careful while cleaning, as caterpillars can sometimes get stuck to your sleeve or hand and you don't want to throw them out accidentally, too! when they get a little larger, you can think about moving them to a butterfly cage. unfortunately, monarchs can run into pests and problems. It hasn't happened often for me, but for a list of parasites or common monarch problems, check here. I prefer to use the standard butterfly cages that they sell in stores, but I have heard about people making their own with small mesh hampers, too. I know they're ready to be transferred from the container to the cage when they are large enough not to get lost in there! I have tried putting the tiny caterpillars in the cage but they are so small that sometimes I cant find them at all once they're in there. So I prefer waiting till they get a little larger before I transfer them to the big cage. My various containers and milkweed collection. What Will The Caterpillars Do in the Cage? When the caterpillars are ready to change, they will start to slow down a bit and eventually make their way to the top of the butterfly cage. When Will They Become Butterflies? They will hang in a "J" for a few days (if you happen to disturb them or knock into the cage, they will curl upwards to protect themselves, but eventually uncurl into the J again). You will know they are ready to change when their bodies start to straighten out a bit. Then they will slowly form into a bright green chrysalis. They will wriggle out of their skin, and what is left, they will shake off in a "chrysalis dance" and it will fall to the bottom of the cage in a little black lump. Bye, bye, old skin! 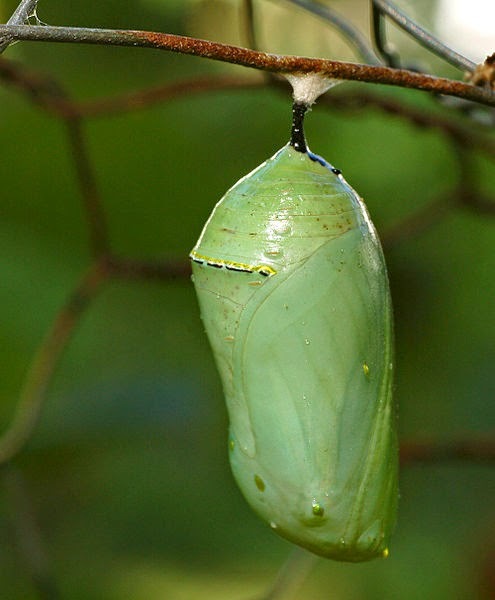 Once the chrysalis stops wiggling, it will remain still for what seems like forever. It can take about 10 days. The chrysalis starts off kind of a dull green but then will slowly become kind of shiny and flecked with intricate golden dots. The chrysalis will turn black (actually transparent, but it looks black at first glance) when they are just about ready to emerge. And then, if you're lucky to witness it, you will see these beauties pop out of their chrysalis. What Do They Look Like When They Emerge? The butterfly's body will be filled with fluid and its wings will be smaller and kind of crunched up. Let them be! 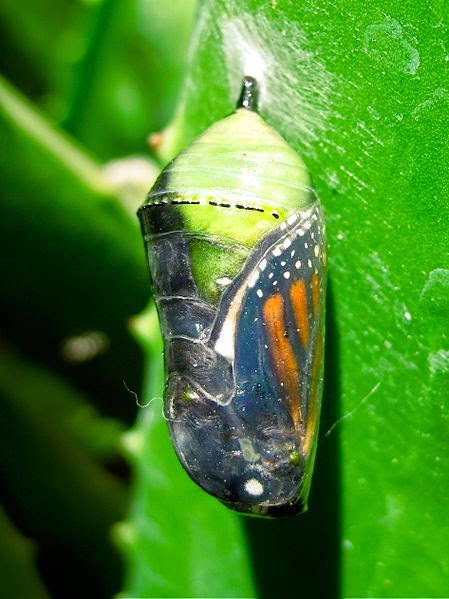 They will rest, hanging from their chrysalis, allowing the fluid to flow into their new wings. Sometimes the fluid will drip down into your cage or on the netting. It can appear reddish or orange. Don't worry, this is normal. The Jersey Momma's Boy is fascinated by the monarchs! They will soon start to look like the beautiful butterfly they were meant to be. You can release them when their wings are dry after a few hours. Do NOT release them in the rain and do not release them if it is below 60 degrees. We try to release them near our garden flowers. Releasing monarchs with Aunt Laura. Time to let them go! They usually fly to a high tree to continue to let their wings dry in the sun, or sometimes we place them on our flowers. Wave goodbye and wish them well! Releasing monarchs in our pajamas. For the best, most accurate information on raising monarchs and growing milkweed, please visit www.monarchwatch.org. If you're looking for some of the monarch raising products I used here, or some great children's books about monarchs, please consider using some of my affiliate links from Amazon below. Thanks!! do you clean out your habitat daily? Yes, I do, and thank you for mentioning that because I should add that to my post. I carefully scoop out frass- you don't want the caterpillars to be walking around in their own poop. Cleaning the cage will help to reduce the risk of spreading disease or illness. I don't use any chemicals or harsh cleaners, I just try to make sure to remove the frass. Water tubes are your friend! Those are the plastic tubes with rubber tops that long-stemmed roses come in. Pop the milkweed stems into a filled-up tube, and they will last long enough for the caterpillars to eat them without drying out. You may have to refill the water--the leaves do draw it down. Amazon has them--I think I got 100 for about $8. We use "Critter Keepers" to keep the caterpillars safe from our cats. Awesome idea, Dori!!! Thanks for that tip!! Another issue I had this year was the milkweed wilting after I cut it. Not sure why that was happening but maybe the water tubes would help there, too. HI Craig! Great site! 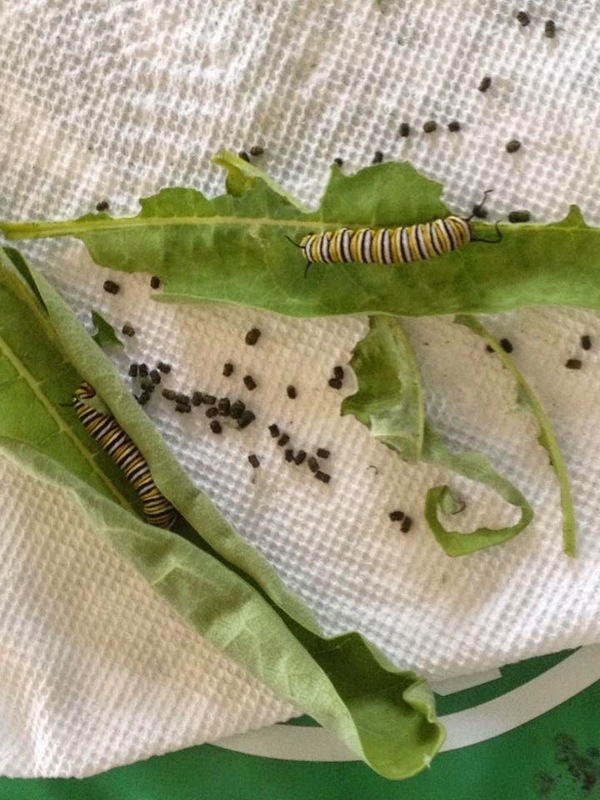 I love seeing others help to save the monarchs, too. I have a monarch caterpillar on inside roof of critter keeper for about 24 hours now. How long d I es it take for it to form chrysalis? Is he hanging in a J formation yet? If he's in the J formation it should just take a few days. Otherwise, watch to see him forming a little white silky "button" that he will eventually hang in a J shape from. Sometimes it takes them a while to find the "perfect" spot! I've had a couple just sitting at the top of the enclosure for a while now. I guess they know when they're ready!